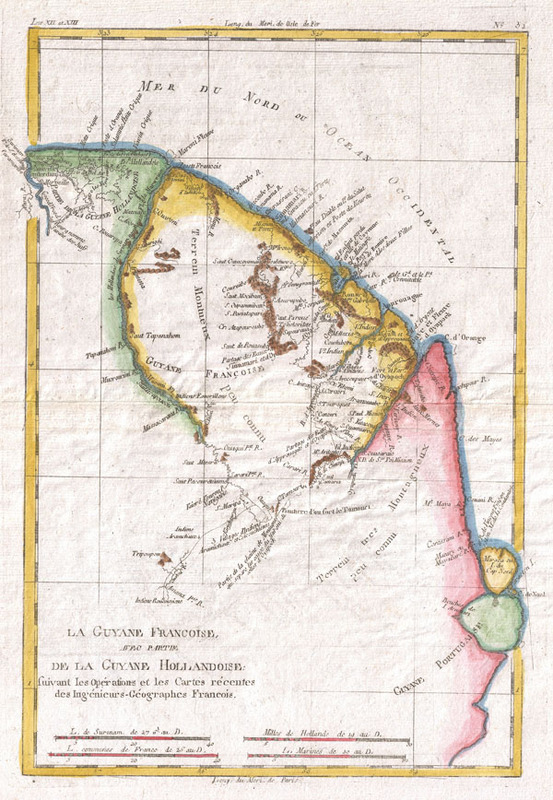 A fine example of Rigobert Bonne and Guilleme Raynal's 1780 map of northeastern South America, depicting Guyana (Guyane). Covers parts of British Guyana, Dutch Surinam in the north, French Guyana (Guyane), modern day Mayapa, a Brazilian state, and Cap de Nord in the south. Most of the data for this map is drawn from records compiled under the Dutch West India Company, which traded throughout the region. While inland information is minimal, trading settlements and missions along both the Maroni River and the Tammouri are noted. Names numerous American Indian tribes and villages throughout. Additionally names Fort Oyapoque, modern day Oiapoque, and major cities, such as Paramibo, the present day capital of Suriname. Drawn by R. Bonne for G. Raynal's Atlas de Toutes les Parties Connues du Globe Terrestre, Dressé pour l'Histoire Philosophique et Politique des Établissemens et du Commerce des Européens dans les Deux Indes.